From Middle English yolke, yelke, ȝolke, ȝelke, from Old English ġeolca, ġeoloca, ġioleca (“the yellow part, yolk”), from ġeolu (“yellow”). 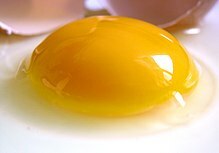 The yellow, spherical part of an egg that is surrounded by the white albumen, and serves as nutriment for the growing young. To make meringue, you have to separate the white from the yolk. The grease in a sheep's fleece.